Initially, the Koskys were so focused on evangelism that they neglected to disciple new converts after being saved. Many were finding salvation, but they were not being grounded in the Word. After all, the Bible doesn’t say “go and make ‘converts’ of all people.” We are commanded to make disciples. After several years of solely evangelistic work, the Koskys refocused their efforts to remain in the new village-churches to disciple new converts. Our Xhosa Christian leaders have been sent to these remote villages to disciple new believers and establish a foundation in the Word of God. But the demand for discipleship continues to grow. As revival was spreading across the Transkei, the mission could not disciple all the new converts. One young leader suggested that the mission start a Bible college to train leaders to disciple the new villages. 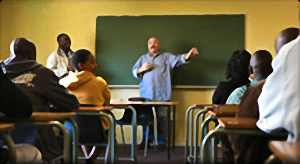 As a result, Gatyana Bible College was established in 1991 to train Xhosa leaders in the Word. The mission has since been developing other means to reach isolated Christians in the underdeveloped regions of the Transkei.